The rise of regular Russian filmmaking in 1907-1908 emerged Russia's first screen actors and actresses. During the first decade or so of cinema in Russia (1896-1907), the repertoire consisted exclusively of foreign, mainly French pictures. It was the "attraction" period in the history of film. Extravaganzas were filmed from the repertoire of "illusion" theaters. In the famous extravaganzas of illusionist Georges Méliès ("The Damned Cave," "The Devil's Retort," "Journey to the Moon," "The Artist's Dream"), the camera was first used not only for recording facts and filming major spectacles, but as a tool to trick people by creating the on-screen illusion of people and objects that seemingly disappear only to reappear or become something else. In the first years of cinema, screens worldwide, including Russia, were full of the "great bagatelles" and "mind-blowing dramas" of the Brothers Pathé and other movie firms. The only factual footage of that period is essentially the chronicle of the Romanovs. Shooting of the "court chronicles" by "his imperial majesty's" personal photographer K. Gan and companion A. Yagielsky began in 1908. They recorded official events in the life of Nikolai II and his family. A breakthrough came with the rise of regular Russian filmmaking. It began around 1907-1908, when industry and commerce saw a recovery after several years of stagnation. The Russian bourgeoisie was becoming more economically active. A new ​​business caught the eye of capitalists: filmmaking. 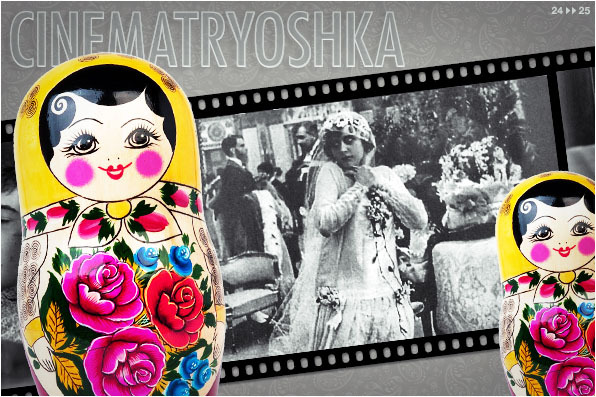 It was this period that saw the emergence of Russia's first screen actors and actresses. The archetypal actress of the era was undoubtedly Vera Kholodnaya. Her popularity broke all records. On one occasion, she was touring Ekaterynoslav by car when a crowd of fans literally picked up the vehicle and carried it along the street. Under the influence of Kholodnaya, women's fashion in the 1910s witnessed a true revolution. Wavy hair and an expressive, richly made-up look marked just the beginning of the transformation. Coiffures and the straight silhouettes of ladies' outfits got progressively shorter, and elegant boots with high heels appeared. Vera articulated new maner of behaviour for the next generation of silent movies artists, such as Olga Tchekhova, Alla Nazimova and others.